What is Depakote? What is Depakote made out of? 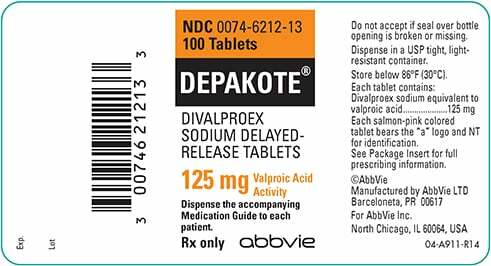 Depakote is a Brand name for an oral medicine that contains divalproex sodium as an active ingredient. Divalproex sodium is a stable co-ordination molecule containing sodium valproate and valproic acid in a 1:1 molar ratio which are formed during chemicals reaction of partial neutralization of valproic acid with 0.5 equivalent of sodium hydroxide. Inactive ingredients in Depakote tablets are: cellulosic polymers, povidone, diacetylated monoglycerides, pregelatinized starch, silica gel, titanium dioxide, talc, and vanillin. It is used for the treatment of certain types of seizures such as complex partial seizures, simple and complex absence seizures and in patients with multiple seizure types that include absence seizures. Depakote is also used as a mood stabilizer for mania episodes in patients with bipolar disorder and for nonspecific therapy of migraine. Is Depakote an antipsychotic medicine? No, Depakote is not antipsychotic medicine, neither typical nor atypical. It is used as a mood stabilizer for mania phases in patients with bipolar disorder, which is depressive disorder not schizophrenic. So Depakote is actually an antidepressive drug, not an antipsychotic. Dpakote is a prescription drug. It is available in following forms: oral extended-release tablets oral delayed-release tablets and oral sprinkle capsules in doses of 125 mg, 250 mg and 500 mg.
Valproic Acid works by dissociating to the valproate ion in the gastrointestinal tract and then by inhibiting enzyme GABA transaminase. It shows its anticonvulsant activity by increasing brain concentrations of GABA – gamma-aminobutyric acid which is the most important inhibitory neurotransmitter in the CNS. Valproic Acid may also work by inhibiting repetitive neuronal firing through blocking voltage-sensitive sodium channels. It is also a histone deacetylase inhibitor. How long does it take for Depakote to get out of your system? Depakote half-life is about 9-16 hours following oral administration of 250 mg to 1000 mg. This actually means that on every 9-16 hours, one half of the previous administrated amount of Depakote is fully eliminated from the body. It is usually needed about 5.5 half-lives for a drug to be completely eliminated from the body, which is about 3-4 days. However many individual factors may have effects on time that Depakote stays in your system such as age, weight, health status, other medicines and etc. If patient suddenly stop taking Depakote, without doctor advice, he will certainly experience withdrawal symptoms. It is not matter whether the medicine is taken to control seizures, manage bipolar disorder, or prevents migraine attacks, withdrawal symptoms are likely to occur and may even worsen the original condition. In any case, Depakote discontinuing must be done gradually and strictly under a doctor’s monitoring. Depakote is a drug that does not cause addiction and is very rarely abused, but that doesn’t exclude it to be the drug that produces withdrawal symptoms when it is suddenly discontinued. Most common Depakote withdrawal symptoms are: anxiety, tremor, irritability, depression and dizziness. But, in very serious cases, severe seizures attack may occur even in those who have not had epilepsy before. This is certainly the most dangerous symptom of Depakote withdrawal and it can be very difficult to control. When untreated, a seizure attacks can result in a condition called sudden unexplained death in epilepsy. In order to control Depakote withdrawal symptoms doctor may prescribe tranquilizers or benzodiazepines such as: diazepam, alprazolam, clonazepam, lorazepam, triazolam or temazepam. Alternative therapy such as aromatherapy, herbal teas and supplements, relaxation techniques and light therapy may be also suggested to boost the effects of benzodiazepines. However to ensure that no side effects will occur, doctor must be informed about the use of any supplement, technique and natural remedies. This is very important when other health conditions such as pancreatic or liver damage are also present in patient who has Depakote withdrawal symptoms. How to prevent Depakote Withdrawal? One way to prevent Depakote withdrawal symptoms is to ensure that the drug is taken in the right dosage, schedule and duration time as it is prescribed. If Depakote therapy has been ongoing for at least two weeks, it is important not to stop taking the drug unless doctor has been consulted. Discontinuing Depakote therapy needs dosage to be gradually reduced so that there is enough time for the body to adjust. Serious health complications may occur if these preventive measures are not conducted. When is the right time to discontinue using Depakote? It is important to remember that doctor is the only one who can adjust dosage and schedule the frequency of Depakote use, gradually reduce the dose, replace the therapy if it is needed and finally discontinue Depakote use if it is adequate time for that. If these actions are done well than patient with epilepsy may exhibit more severe seizure attacks, those with migraine may got more intensive and prolonged migraine attacks and patients with bipolar depression can have wilder mood swings.